A marketing agency Definition 6 collaborated with Facebook to produce a browser tool Timeline Movie Maker that transform your Facebook Timeline into a video. Do try Timeline Movie Maker now. Economist Nouriel Roubini, nicknamed 'Dr Doom', who successfully predicted the sub prime crisis in 2008 is now predicting the current financial slowdown could last a decade unless Europe radically reforms itself and the United States gets serious about its own overwhelming debt deficit. He painted a grim picture of the euro zone in recession and key emerging markets in China, India, Brazil and South Africa slowing down. The biggest uncertainty is the possibility of a conflict with Iran over its nuclear programme - which could lead oil prices to spike to US$150 per barrel, and lead to a global recession, he said. Calling for a major change in policy priorities, Dr Roubini said: "We have to shift our investment from things that are less productive like the financial sector and housing and real estate to things that are more productive like our people, our human capital, our structure, our technology, our innovation." Slow growth in advanced economies will likely lead to "a U-shaped recovery rather than a typical V", and could last up to 10 years if there is too much debt in the public and private sector, he said. At a panel discussion yesterday, Dr Roubini also said Greece will probably leave Europe's single currency within 12 months and could soon be followed by Portugal. 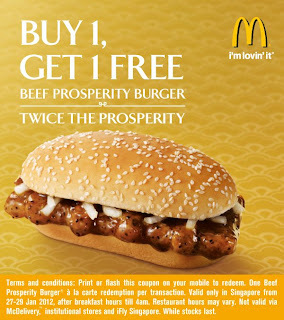 McDonald is now offering a time limited offer from 27 to 29 January 2012 for its 1-for-1 Prosperity Burger. 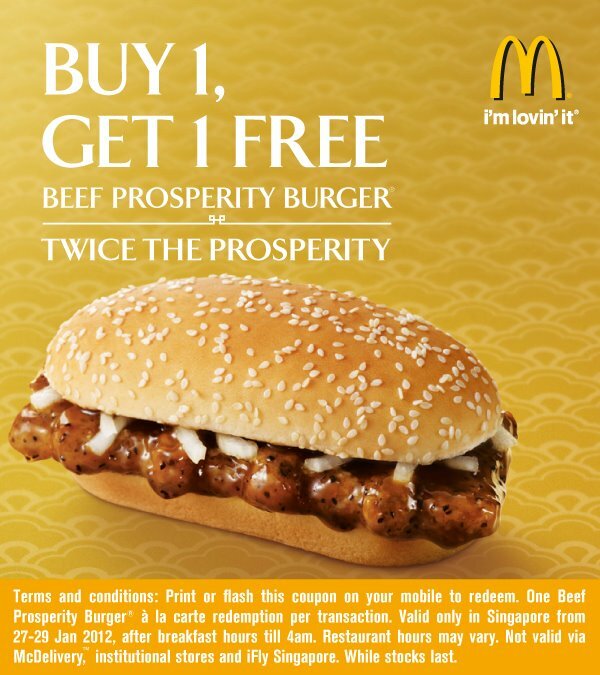 To redeem, simply flash the coupon on your mobile device. 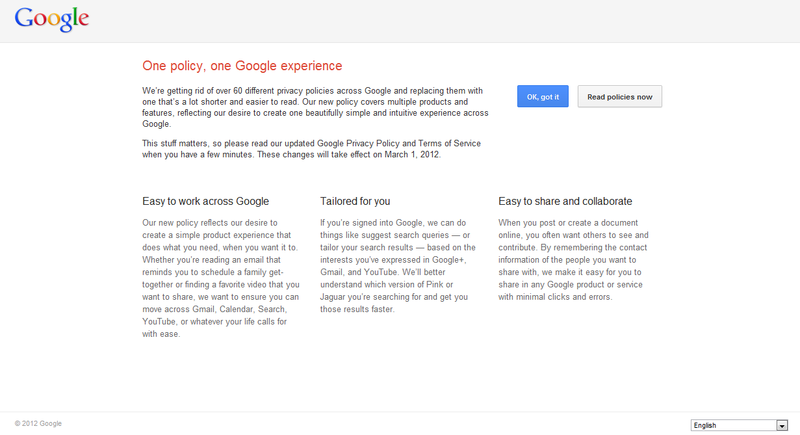 Google+ announced more options for Google+ badges. You can configure a badge with a width that fits your site design and choose a version that works better on darker sites. You'll also see that Google+ badges now include the unified +1 and circle count that we added to Pages last month. Start creating your Google+ badge now. Social networking sites Facebook, Twitter and MySpace together launched the "Don't be Evil" bookmarklet in response to Google including its Google+ pages in its search results. Google+ integration into search results has been criticised by competitors that it is not displaying the most relevant social network for an individual, and rather, it's simply promoting their (often less relevant) Google+ page. The "Don't be Evil" bookmarklet attempts to put focus back to the user, looks at the three places where Google only shows Google+ results and then automatically googles Google to see if Google finds a result more relevant than Google+, and showing them instead. There are two methods to trying out the "Dont' be Evil"
Go to Focus on the User (www.focusontheuser.org), click on the "Try a More Relevant Google", and then drag the "Don't be Evil" bookmarklet to your browser's bookmark toolbar. Next time you perform a search that displays social results, click the bookmarklet for improved social results. Install this browser extension to automatically run our bookmarklet every time you go to google.com. Some numbers from the Apple's first quarter earnings as summarised by Mashable. Apple sold 37 million iPhones in the quarter, a 128% jump over the comparable quarter in 2010.
iPad sales hit 15.4 million, a rise of 111%. Mac sales were 5.2 million, an increase of 26%. Apple sold 15.4 million iPods, a number which is down 21% as the iPhone cannibalizes sales of more limited-function devices. Apple now has $97.6 billion in cash on hand. Revenues from iTunes hit $1.7 billion. More than 140 million apps and pieces of content were downloaded on Dec. 25. There are 1.5 million iPads being used by educational institutions. iCloud has 85 million users. There are now 550,000 apps available. Developers of such apps have earned more than $4 billion, $700 million in Q1. Apple Stores produced $6.1 billion in revenues for the quarter. The average revenue per store was $17.1 million vs. $12 million last year. There are about 22,000 visitors per store per week. Apple’s revenues for the quarter were higher than the company’s revenues for its entire fiscal 2009. Wonder just how much content YouTube is generating? According to the latest statistics, daily views is at 4 billion and in every second, an hour of video is uploaded. Shown on the Omni-Theatre here. Just too bad that it is only 2D. How to extract tar ball (tar.gz, tgz) using command line? If you have a tgz or a tar.gz archive, you may use the following to extract its files using command line interface. Extract to a different target directory. Starhub is offering over 140 channels of exciting entertainment from 20 January (12pm) to 26 January (12pm), all for FREE in conjunction with the Lunar New Year. 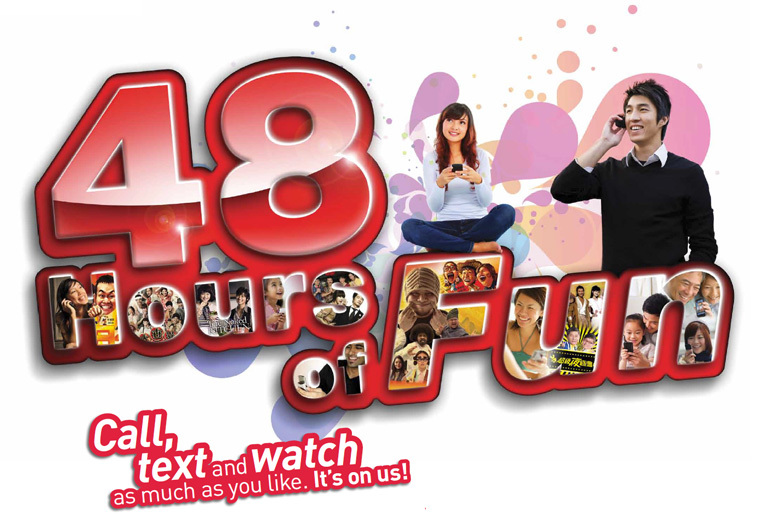 SingTel announced on its website 48 hours of free local mobile calls, SMS and MMS from 23 Jan 0000hrs to 24 Jan 2359hrs. 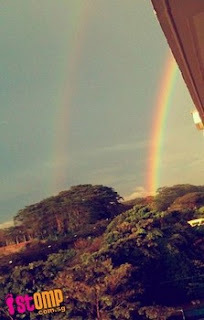 Hope double rainbow just before Chinese New Year will bring better days for Singapore. During the match between home favourite Lleyton Hewitt and Cedrik-Marcel Stebe, an unwanted insect invader became the centre of attention as Stebe asked for the bug to be removed before continuing. This ball girl picked up the bug quickly but dropped it while running away from the scene attempting to throw it away. Her brave action attracted much cheers from the crowd. Wishing all our readers a Happy and Prosperous Chinese New Year of the Dragon. Update the Package Index - Run this command periodically to make sure your source list is up-to-date. Upgrade Packages - This command upgrades all installed packages. Upgrade Packages with "smart upgrade" - The same as the above, except add the "smart upgrade" checkbox. A poem titled 来了新加坡才知道···, composed by a mainlander PRC who visited Singapore recently. An interesting article explaining the response codes 404, 301 and 302. Facebook announced the integration of 60 apps (more to come) to timeline. Read more here. A professor, Kong Qing-Dong (孔庆东), from the Mainland China Peking University gave his commentary labelling Hongkongers as 'dogs' on the recent incident involving a quarrel between Hong Kong and mainland passengers on a MTR train in Hong Kong. The quarrel on the train was sparked after angry Hongkongers tried to stop a mainland girl eating a snack on the train. The incident was captured in a 2-parts video and uploaded onto YouTube. The mainlanders apologised eventually only after the train staff was alerted. So, did the mainlanders know eating is not permitted in trains in the first place? In the Part 2 video, the little girl was heard telling her mother they should be the one in the wrong but was quickly "ssshh" by her mother. Note A workbook that contains one or more Excel tables cannot be shared. The internet is the most powerful tool we have for creating a more open and connected world. We can't let poorly thought out laws get in the way of the internet's development. Facebook opposes SOPA and PIPA, and we will continue to oppose any laws that will hurt the internet. Some guidelines / best practices on .NET development [pdf]. The English Wikipedia is now blacked out globally to protest Stop Online Privacy Act (SOPA) and Protect Intellectual Property Act (PIPA). For over a decade, we have spent millions of hours building the largest encyclopedia in human history. Right now, the U.S. Congress is considering legislation that could fatally damage the free and open internet. For 24 hours, to raise awareness, we are blacking out Wikipedia. To learn more on the SOPA and PIPA, click here. If you are interested to try out Microsoft's latest social networking site So.cl, simply like my Facebook page below and I will send you an invite. I have quite a few invites to spare. Microsoft entry to the social network industry is still in its development, with a brand new social network called So.cl, dropping the vowels, which pronounces the word as Social. So.cl is still under development and is open for a limited amount of users. I am still waiting for an invite. Do drop me one if you have spare invite. Google on Thursday unveiled Android Design site, a guide on how to create the best Android apps and interfaces. It is a place to learn about principles, building blocks, and patterns for creating world-class Android user interfaces. Ever wonder if a shortened url is harmless or malicious? The following are 5 url expanders capable of revealing the actual full url. You may use http://goo.gl/Cb4La for your own testing. Google will be releasing a Google maps oriented game for Google+ in February. Watch the preview features in the following video. 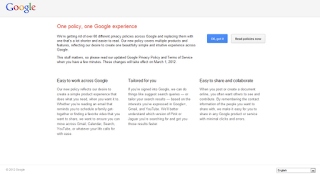 To know what exactly is and the services provided by Google Maps, click here for a quick walkthrough. Popular game on iOS devices, 'Cut the Rope', is now on HTML 5, meaning, it is now possible to run it on a modern browser. The project is a collaboration between ZeptoLab and Microsoft. Go to http://www.cuttherope.ie/ now to try it out. Google top U.S. search engines ranking, Bing overtook Yahoo! Latest comScore report shows Google still led the U.S. explicit core search market in December with 65.9 percent market share (up 0.5 percentage points), followed by Microsoft Sites with 15.1 percent (up 0.1 percentage points) and Yahoo! Sites with 14.5 percent. Ask Network accounted for 2.9 percent of explicit core searches, followed by AOL, Inc. with 1.6 percent. Yes, Microsoft is now second, overtaking Yahoo! along the way. Google has been rolling out gradually and soon, search results will begin showing in its new "Search Plus Your World" format. In this new format, it finds both content that's been shared with you privately on Google+ along with matches from the public web, all mixed into a single set of listings. From a Google blog post, three new features are introduced to make up the "Search Plus Your World"
As listed Bloomberg Businessweek, SMRT former CEO Phaik Hwa Saw total calculated compensation amounted to $1,847,611 for having tendered her resignation amidst series of SMRT trains breakdowns incident in December 2011. The following Microsoft SQL function will help return an integer, determining one's age given date of birth. Hope it helps. Please refer to below for a summary of the report submitted by the Review Committee to Ministerial salaries. The full Review Committee's report can be found here. Senior Minister of State for Ministry of Environment and Water Resources Grace Fu wrote on her Facebook page on Wednesday in response to the recent announcement by the Ministerial Salary Review Committee. 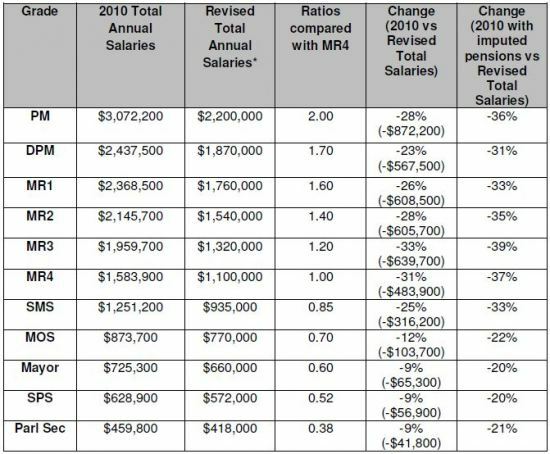 The committee suggested on Wednesday cutting the prime minister's annual pay by 36 per cent to S$2.2 million, ministers' yearly wage by 37 per cent to S$1.1 million and the president's annual salary by 51 per cent to S$1.54 million. 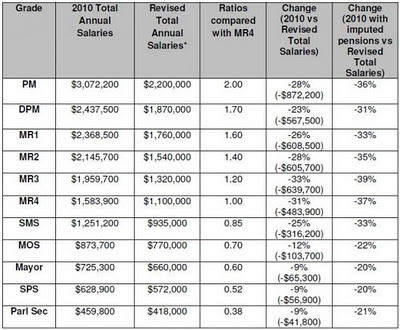 When I made the decision to join politics in 2006, pay was not a key factor. Loss of privacy, public scrutiny on myself and my family and loss of personal time were. The disruption to my career was also an important consideration. I had some ground to believe that my family would not suffer a drastic change in the standard of living even though I experienced a drop in my income. So it is with this recent pay cut. If the balance is tilted further in the future, it will make it harder for any one considering political office. Her Facebook post has since gathered over a thousand comments so far, of which many were criticisms. In response to these criticisms, Grace Fu remarked the public has misunderstood her. She replied, but still holding onto her stand of further cuts may dissuade talented people into joining politics. Thank you all for your candid views. I respect all of them. I realise my last posting could have been misunderstood. The committee has done a thorough job with a substantial recommendation over a fairly emotive topic. I accept and respect the recommendations. I am honoured to be given the opportunity to serve the people. However, it may not be wise to call for the tradeoffs to be tilted further to an extent that it dissuades good people from coming forward in future. I read today's papers and some readers make the same point. Thanks for your views again. If you are getting "Page Not Found (404) Error" when you are trying to assess a Ektron URL alias page on IIS 7.x, you may be missing a module mapping. In you web.config file, make sure you have the following key under the <modules> section. You may ensure that your web.config contains all of the handler mappings from the IIS 7 example configuration file (Usually found in C:\Program Files\Ektron\CMS400vXX\CommonFiles\IIS7Web.config). A hand grenade throwing exercise went horribly wrong in China when a recruit's throw had his grenade hit a sandbag wall instead of over it. The live hand grenade bounced back and landed into the ditch beside the recruit and the instructor. The quick-witted instructor nimbly dived into the other side of the ditch, dragging the recruit together with him, saving his life, before the grenade exploded in seconds. What puzzled me is the instructor actually rose up and began clearing the mess coolly and naturally to prepare for the next hand grenade thrower, as if such incident is common anyway. Hope not. A short 48-seconds video clip showing the incident captured over 1.8 million viewers so far. Watch the video below. A new infographic from BlueStacks pulled data from Nielsen as well as poll responses from its 145,000 Facebook fans to create a picture of the average male Android user in 2011.